Rep. Daniel Donovan (R-Staten Island/Brooklyn), center, beside flag, meets on Capitol Hill with SIBOR representatives, from left, Sandy Krueger, CEO; Aleksandr Stolyar; Greg Sokol, president-elect; Assaf Epstein, an international director of the National Association of REALTORS®, George K. Wonica, a past president of both SIBOR and the New York State Association of Realtors (NYSAR); Sari Kingsley, SIBOR past president and NAR President’s Liaison to Israel; Claire Bisignano Chesnoff, president of SIBOR; Dil Gillani, immediate past president; Dawn M. Carpenter, SIBOR past president and NYSAR president-elect; John Vernazza, SIBOR past president and NAR liaison to Congressman Donovan; Erica Orlando; Kawing Chiu, and Phyllis Cangro. 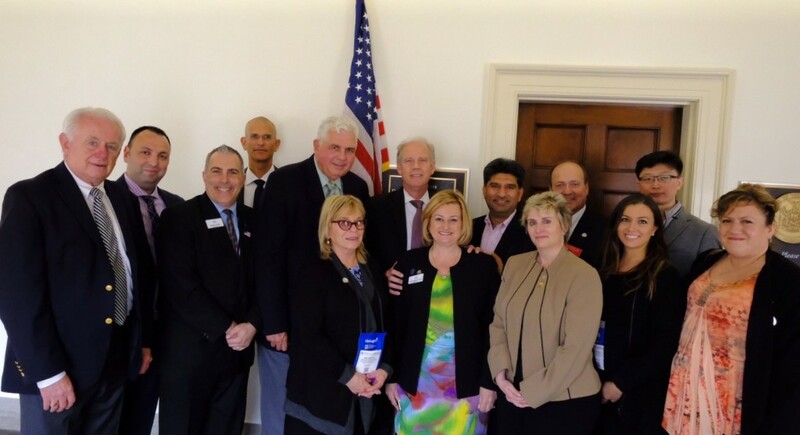 STATEN ISLAND, N.Y. (May 2016) – Representatives of the Staten Island Board of Realtors (SIBOR) recently joined with nearly 8,900 Realtors® from across the nation to meet in Washington, D.C., to advance issues critical to their businesses, communities and clients. The initiative took place May 10-14 during the 2016 REALTOR® Legislative Meetings & Trade Expo. During their visit to the nation’s capital, SIBOR members attended meetings and visited with regulators and lawmakers on Capitol Hill to discuss the legislative and regulatory environment and its effect on residential and commercial real estate. Attending Realtors®, all members of the National Association of Realtors® (NAR), focused on several major issues pertaining to the industry during the legislative-focused meetings. Of utmost importance was protecting real estate-related tax policies, which are vital to expanding homeownership to more Americans. “Supporting homeowners and property owners through smart legislation is so important for families, communities and the nation’s economy, so we will continue to work with lawmakers to ensure they are protected,” said Claire Bisignano Chesnoff, president of SIBOR. While in Washington, SIBOR members met with Rep. Daniel Donovan (R-Staten Island/Brooklyn) and Sens. Kirsten Gillibrand (D-NY) and Charles (Chuck) Schumer (D-NY) to influence public policy decisions that will directly affect consumers’ ability to own, buy and sell real estate. Specifically, Dawn M. Carpenter, a SIBOR past president and New York State Association of Realtors (NYSAR) president-elect, urged Sen. Gillibrand to preserve current real estate-related tax policies and extend the Mortgage Forgiveness Tax Relief Act, which prevents distressed homeowners from receiving excessive income tax bills on forgiven home loan debt. During the week-long conference, Realtors® heard from industry and political thought leaders, including U. S. Department of Housing and Urban Development Secretary Julián Castro, who discussed student loan debt and its impact on homeownership. Castro shared some of the regulatory changes coming soon to make sure younger Americans have housing opportunities, as many of them are bogged down by loans they borrowed to earn a college degree. Those changes, which pertain to condo rules, could broaden the number of condos available to FHA homebuyers. In addition, U.S. Sen. Elizabeth Warren (D-Mass. ), shared her perspectives on housing finance and student debt; political pollsters Peter Hart and Bill McInturff offered insights into the mood of the country and its impact on the 2016 presidential and congressional campaigns; investigative journalist and author Bob Woodward shared his thoughts on the presidential elections; and Wells Fargo economist Mark Vitner discussed financial and commercial real estate markets. NAR Chief Economist Lawrence Yun also shared residential and commercial real estate market updates and forecasts. Realtors® also had the opportunity to speak with several regulatory agencies, including the Environmental Protection Agency, the Federal Housing Finance Agency, the Department of Agriculture’s Rural Housing Service, the Department of Transportation’s Federal Aviation Administration and the Department of Veterans Affairs, among others. Aside from the informational legislative sessions, SIBOR representatives also had the opportunity to explore the latest industry innovations and get up to date on how new products are transforming the real estate business by visiting the almost 120 exhibitors showcasing the newest real estate products and services for the industry during the trade expo. In addition to CEO Krueger, President Bisignano Chesnoff, NYSAR President-Elect Carpenter and SIBOR President-Elect Sokol, SIBOR was represented by Dil Gillani, immediate past president; George K. Wonica, a past president of both SIBOR and the New York State Association of Realtors (NYSAR); Sari Kingsley, SIBOR past president and NAR President’s Liaison to Israel; John Vernazza, SIBOR past president and NAR liaison to Congressman Donovan; Phyllis Cangro; Richard Mohr; Kawing Chiu; Erica Orlando, and Aleksandr Stolyar.